The singles club was a massive success! Thanks to everyone involved! We expect to have two full sets left for sale SO if you missed out, go HERE to order one of the last sets! $210 post paid. 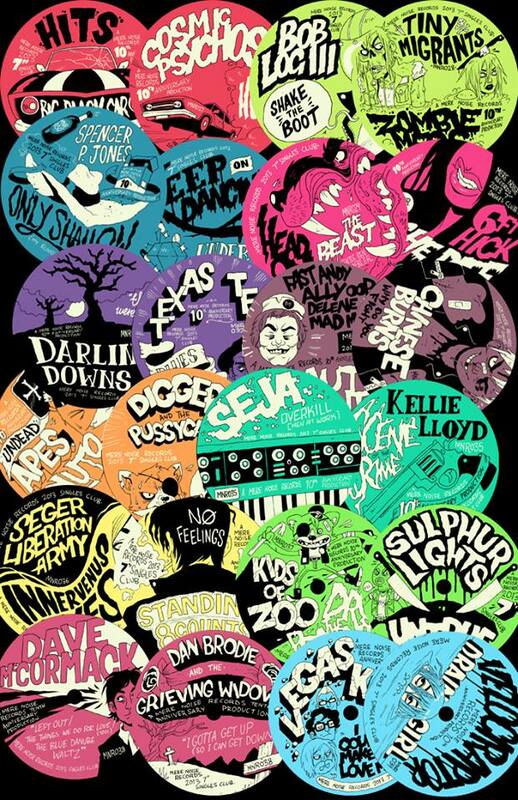 These 12 records, each have individual artwork from Sam McKenzie. They will NEVER be repressed. Many of these tracks are available NOWHERE else, each record is one of 150, and is encased in a sleeve and shrink-wrap for those in the collecting game. We’ll be donating every cent of profit from this series to the Black Dog Institute. They’re an organisation working hard on addressing mental health and the stigma of mental health in Australia. It’s important stuff we reckon. We have odd numbers of some of the singles which we will sell separately from now until Sunday 30th March 2014. Seger Liberation Army / Standing 8 Counts – SOLD OUT! Buy one or many here!